Mike Hall, 30, who hails from North Yorkshire, is one of nine cyclists competing in an epic unassisted race around the globe, beginning the challenge on February 18 from the Greenwich Meridian at the Royal Observatory in south-east London. 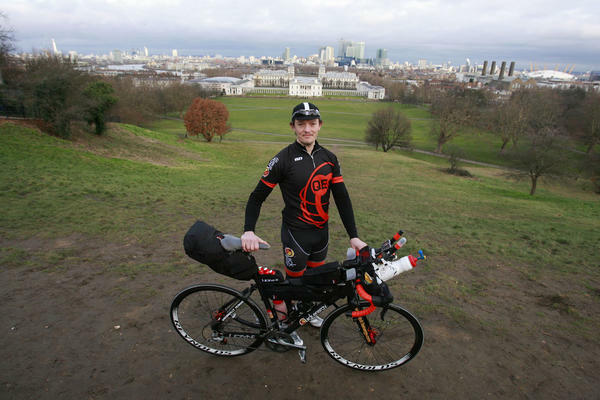 As part of the World Cycle Racing, Mike Hall, 31, rode into the Greenwich royal observatory today 92 days after he left. The Guardian explains that to come full circle, he travelled 24,900 miles and biked 18,000 of them through "20 countries and four continents to raise money for the Newborn Vietnam charity." That's about 200 miles a day. And that means the engineer has broken the around the world cycling record set by Alan Bate in 2010. According to Guinness, Bate circumnavigated the globe in 106 days, 10 hours and 33 minutes. You may be questioning how this record is possible. Guinness World Records has decided that instead of having to bike for the whole circumference of the globe, the record is set by riding at least 18,000 and traveling at least 25,000. You can see how Hall accomplished his feat in this map. Essentially he started in Britain, biked through Europe. Flew from Turkey to southern India, where he biked almost to the Bangladesh border. From there, he flew to Australia, crossed that continent on a bike, went on to New Zealand and then flew to Vancouver, where he rode along the west coast of the United States and through the entire country ending up in Portland, Maine from where he flew to Portugal and biked back to England to finish the race on his birthday. "Hall, from Harrogate, north Yorkshire, said he felt 'stunned' as his friends and family popped champagne corks and sang Happy Birthday. 'I think I had a lot of the emotions in the last few weeks on the roads. It was quite difficult and I think it builds up – the stress,' he said. 'So I kind of released all that in the last few days. Now I just feel pretty calm. "He said the worst thing to happen during the race was when he rode into a hole in Albania. 'I broke my bike but managed to fix it with some parts I had, then had to ride through the night to get to Greece. There were a few close calls with traffic, but I just tried to keep safe, keep vigilant.'" As Bike Radar reports, Hall started the race back in February. Nine cyclists started and only four are still in it. Back in June, The Guardian took a look at the race and noted a one of the key differences between Hall and his fellow racers. Hall kept his bike very, very light. Some of his opponents carried up to 60 pounds of gear, while Hall kept his to no more than 35 pounds. Guinness World Records has to give its approval, of course, before this becomes official.